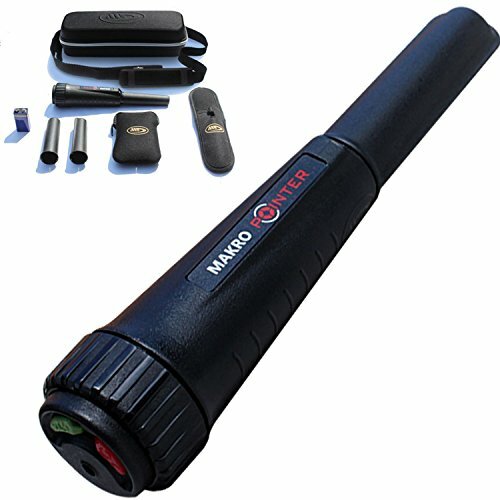 This is my honest Makro Waterproof Pin Pointer Review based on actual use and extensive research. I am in no way affiliated with Makro. There are many pinpointers on the market, some very popular and some not so. It all boils down to your budget, think buy cheap buy twice. The Makro Waterproof Pointer was the worlds first fully submersible waterproof pinpointer. 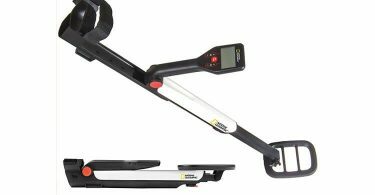 Makro are a relatively new company to the Metal detecting world, however, they really are making waves on the market, releasing some very popular and high-performance detectors like the Makro Racer. Based in Turkey, Makro released their version of a pinpointer in 2014 and it has proven very popular since. What do you get with the Makro Waterproof Pointer? Well unlike other pointers this comes with a really awesome hard case which has a strap attached. You can carry it around with you and keep it protected at the same time. You get a belt holster, although I did find it quite a tight fit it may take a little adjusting. Battery included! Hooray. No going out to find a 9volt battery, oh I do like it when they include the battery! Hardshell case with scraping blade, making it a little easier when you’re scraping away soil and ground in the hole. So how does it perform, what features has it got, is it worth the money? Let’s take a closer look. Unlike other pinpointers, the buttons are located in a different place so it may take some getting use to. The buttons are located at the top of the pointer and it is believed that this will help increase the performance and reliability. The Makro pointer is black in colour with green and red buttons at the top. You will find the battery compartment located beneath the buttons and this is accessed by unscrewing. It takes 1 x 9-volt square battery and will give you approximately 30 hours use. The Makro is protected by 2 replaceable hard shell casings. Very similar to how a coil cover would fit your search coil. It’s fairly lightweight at 235 grams. 24 cm in maximum length with a 9.3 cm detection tip. Waterproof: IP67 Standard approved, the Makro Pinpointer is fully waterproof and submersible. A true all terrain and conditions handheld pin pointer. 360 degrees detection tip: The detection probe tip has 360 degrees detection allowing you to cover more area and making the Makro PinPointer much more effective. 4 Level Sensitivity Control: There are 4 levels of sensitivity which can be easily adjusted by the plus and minus buttons. Helping you achieve maximum detection levels in any terrain or condition. Audio & Vibration Alert: A good strong clear audio response from the built-in speaker, choose from audio only, audio and vibrations or vibrations only. LED Light: Light up the hole or spot that you are searching with the built-in LED flashlight. OK, so not quite the Garrett Pro-Pointer AT but it is priced a good 40 quid cheaper. I like that the pointer has the replaceable casing, and once you get used to it I actually do prefer the placement of the buttons. In the field, it worked fantastically, after getting used to a couple of things of course. To see if it was true to its word, I decided to test the pointer out in a bucket of water. Fully waterproof and works flawlessly. I really like the sensitivity controls I imagine this would be great for the beach where the ground is highly mineralised. Simply knocking the sensitivity down would make it much more stable in highly mineralised conditions. When you switch on the Makro Waterproof pointer there is a slight delay, which is a little bit annoying at first. Again it’s something you get used to. The holster definitely needed adjusting its slightly on the small side so the pointer can get stuck when trying to pull it out. A simple fix but worth doing to stop you losing your mind. For those who want all of the features of more expensive pointers then the Makro comes recommended. There are a couple of slight annoyances like the delay and the holster but once you get used to them I suppose it’s worth the money you save! A powerful Pinpointer at a very fair price.